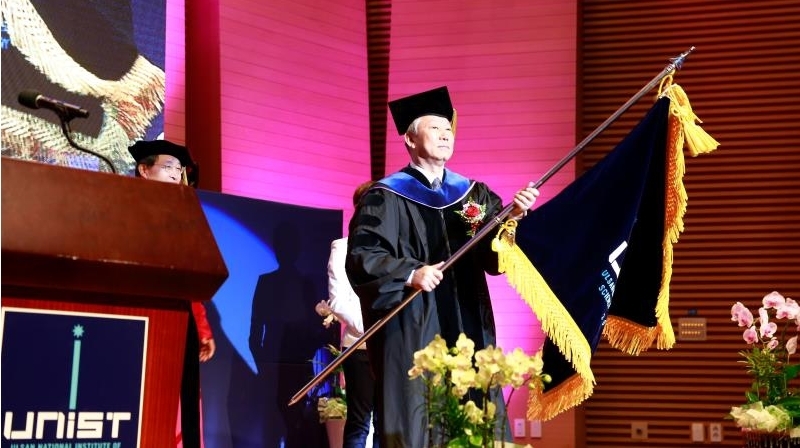 Dr. Mooyoung Jung, holding the official flag of President at the Inauguration Ceremony, moments after being formally inaugurated. 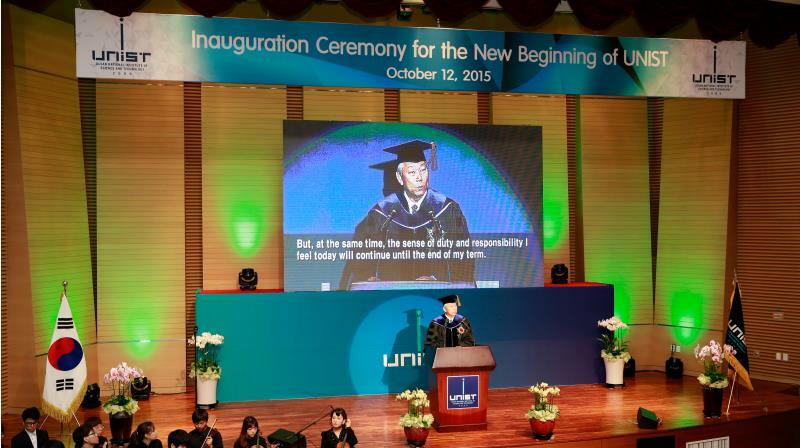 In a colorful ceremony filled with the presidential emblems, music, and well-wishes from university and community, Dr. Mooyoung Jung was formally inaugurated as the 3rd President of UNIST at the Inauguration Ceremony of UNIST. 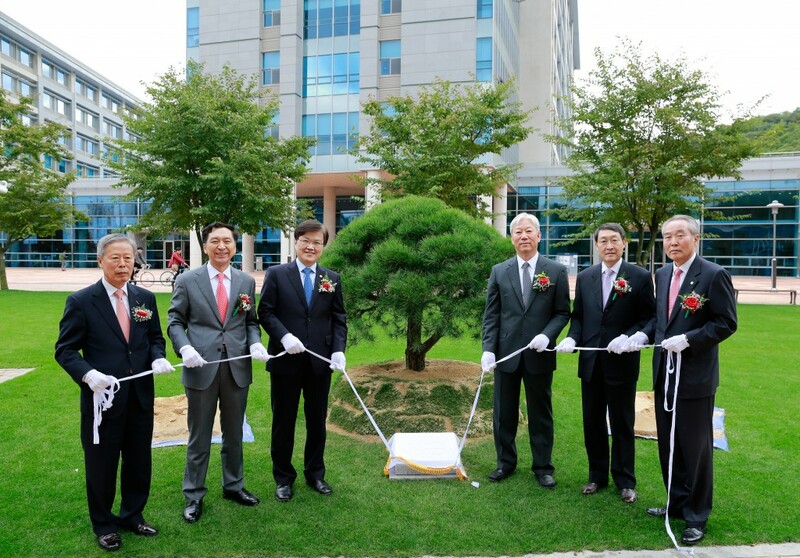 The ceremony, at 11 a.m. in the auditorium of Main Administration building, was attended by 500 guests, including Dr. Yanghee Choi (Minister of Science, ICT and Future Planning), Mr. Gab-yoon Jung (Vice-chairman of the National Assembly), and Presidents from KAIST, GIST, DGIST, and POSTECH. 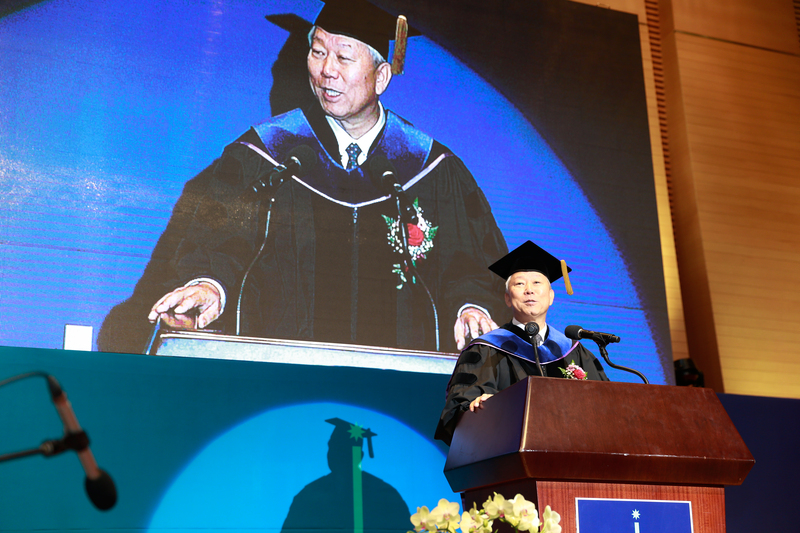 During the course of the event, Dr. Jung gave his inauguration speech in front of the faculty and staff members, students, alumni, government officials and other supporters, moments after being formally inaugurated and presented the official flag of the president. 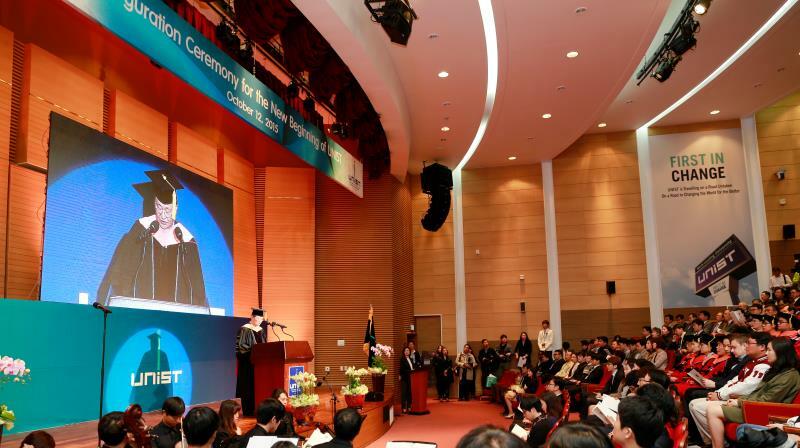 There, he laid out his vision to build on the university’s excellence by more effectively promoting and fostering interdisciplinary collaboration and research, as well as by cultivating innovative leading talents in science and technology who will shoulder the future of Korea. President Jung started his term as of Monday, September 28th, 2015 and will remain in his position until the end of September 2019. 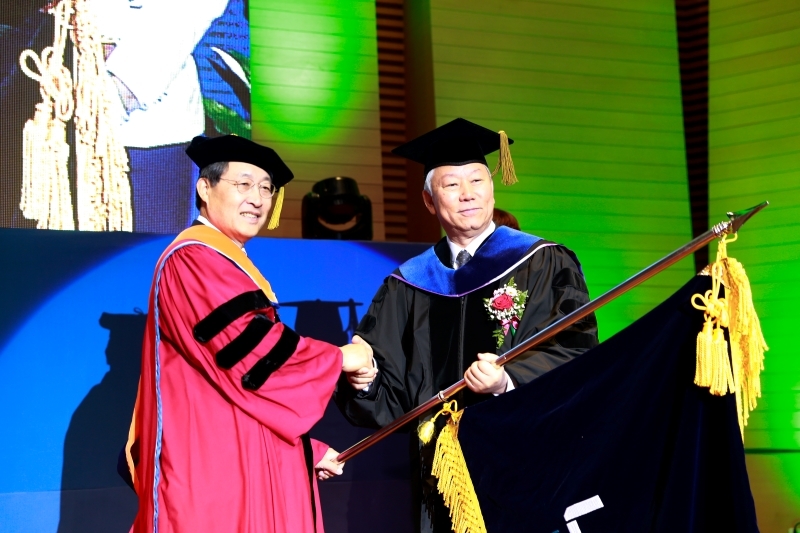 Dr. Hyun-Soon Lee, Chairman of the UNIST Board of Directors is presenting the official flag of the president to Dr. Mooyoung Jung. President Jung, giving his inauguration speech, moments after being formally inaugurated and presented the official flag of the president. 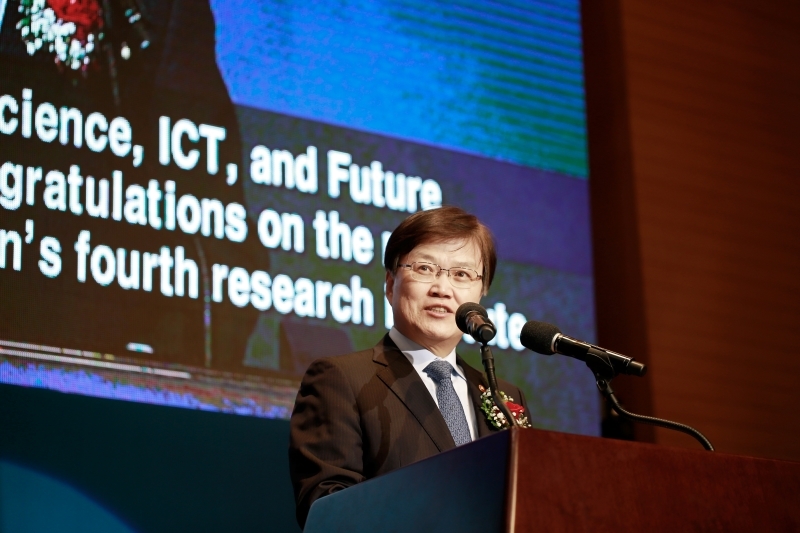 Dr. Yanghee Choi, the Minister of Science, ICT and Future Planning, delivering a congratulatory speech at the Inauguration Ceremony on Oct. 12th, 2015. 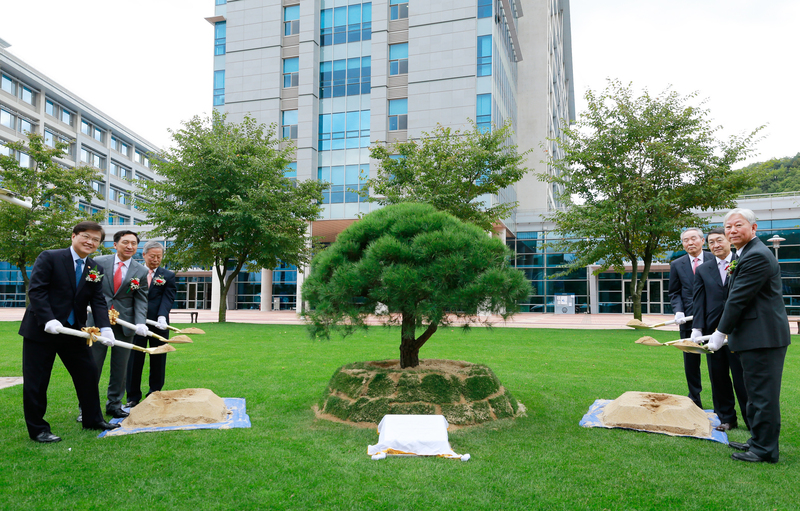 Following the speeches, as a commemorative activity, major guests were invited to join a tree planting ceremony.